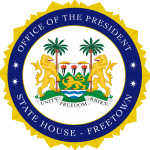 State House, Freetown, Tuesday 9 October 2018 – His Excellency President Julius Maada Bio has joined families and others to mourn the death of eight military officers and their children killed in a gruesome road accident in Freetown on Monday. The inter-faith funeral service, which took place at the Hockey Pitch on Wilberforce Barracks west of the capital, was also attended by First Lady Mrs Fatima Bio, Chief Minister Professor David John Francis, Deputy Minister of Defense Rtd. Colonel Simeon Sheriff, other members of government as well as friends and families of the deceased. Chief of Defence Staff of the Republic of Sierra Leone Armed Forces (RSLAF), Lieutenant General Brima Sesay, said they were dismayed by the death of the serving military personnel whom he described as professional and diligent in their duties. He added that it was a traumatic event for the RSLAF and noted that the deceased would sorely be missed.